Lifestyle choices and genetics can lead to a painful mouth condition known as receding gums. This type of gum disease sees the tissue surrounding the teeth pull away, revealing the root of the tooth. Gum recession is also referred to as gingival recession and often goes unnoticed until sensitivity or pains arise. We will look at receding gums causes and how to fix receding gums. If you think you may have gums receding, it is important to know exactly what can be done to prevent further damage. Once your gums begin to pull back from the tooth, you are at a high risk for infections, tooth decay, and eventually tooth loss. You may also want to know about natural treatment options, so we have shared some receding gums home remedies below. A gum recession can go unnoticed as it is a slowly progressing disease; therefore, it is important to know what can cause the problem. There are different factors linked to this process in which gaps form between the tooth and the gum line. The harder you brush your teeth, the higher the risk of damaging the enamel of the tooth. This can lead to gum receding. It is best to use a soft-bristle toothbrush and use gentle strokes while brushing. One of the primary harmful products to your teeth are the chemicals found in tobacco, both in cigarette and chewing forms. These chemicals form a plaque on the teeth and gums that damage the tissue. The plaque is also hard to remove. If you have gum diseases, such as those caused by bacterial infections, the gums may start to withdraw. This is caused by the destruction of tissue and tooth bone. A lack of proper dental care—at home and at a dental office—can lead to receding gums. The damaging plaque that builds up on teeth and gums needs to be removed with regular brushing and flossing. Otherwise, the tissue becomes irritated and begins to recede. Often, we may grind our teeth while sleeping or clenching down hard during the day without even knowing either is happening. The constant force on the teeth can loosen them and make the gums move away from the teeth. For those who may have a spectacular dental routine and still suffer from receding gums, genetics may be at play. Despite their best efforts, some are prone to periodontal diseases, which lead to gum recession. Teeth that are misaligned or crooked from disease, poor oral hygiene, direct hits to mouth, and improper dental skills, are difficult to maintain. The inability to thoroughly clean these teeth as well as the pressure on surrounding teeth can cause receding gums. Mouth piercings on tongue or lips can wear down the gum surface with irritation. Hormone levels can have an indirect effect on gums, which may be damaged by inflammation. This happens during menopause and pregnancy, and can lead to retreating gums. During orthodontic treatment, it is important to follow an appropriate timeline dependent on the movement and growth of the teeth. By forcing the correction of the too quickly, the gums may move and recede. Regular dental work for receding gums treatment begins with a physical examination as well as X-rays of the mouth. You can expect your dentist to use an instrument called a probe to check for small air pockets between the tooth and the gum. 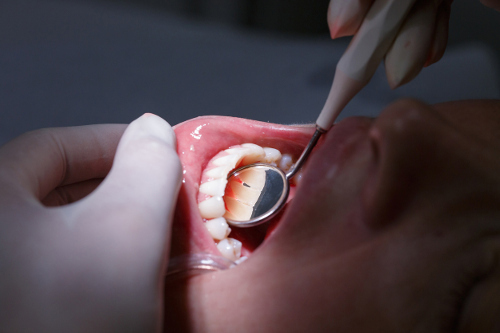 Advanced treatment may be done by a periodontist who can perform various procedures to save the gum tissue and teeth. Medications may be required to treat any infections and or may be used as a pain reliever. The two possible surgical procedures are flap surgery and grafting. So, do gums grow back? Receding gums home remedies may help to treat current gum problems and restore gums to their natural setting. The antioxidants in green tea may work to combat free radicals that can settle into your mouth and cause receding gums. The tea may also help to strengthen the attachment of the teeth to the gums. Any swelling could be treated by the anti-inflammatory properties of the green tea. Drink one cup each morning. Aloe vera has antibacterial and anti-inflammatory properties that could fight infections and swelling. It may also promote cell restoration to heal the gum recession. After brushing and flossing in the morning and at night, brush teeth again with aloe vera gel on your toothbrush. Rinse the mouth after three to five minutes of treatment. You can also use the aloe vera gel as a mouthwash. Mix some with water and rinse your mouth. This powerful essential oil might work to reduce inflamed gums while destroying germs. It could also promote new cell growth of the gum tissue. Dilute one to two drops of eucalyptus oil with one to two tablespoons of water. Use a soft-bristle toothbrush and dip it into the solution. Massage onto gums and rinse with plain water. Clove oil has antibacterial and anti-inflammatory components to combat receding gums. Place one to two drops of clove oil on your finger and massage onto gums for several minutes. Repeat one to three times each day. You could potentially destroy germs and harmful bacteria by chewing a clove after meals as well. Stimulate new tissue growth of the gums with the use of lemon oil. It contains antiseptic and antibacterial components that may help combat disease. However, please note that the harshness of the acid in lemon can damage enamel. Any lemon oil treatment should only be used sparingly once a week. To prevent enamel damage, mix a quarter to a half cup of olive oil with the juice of one-half of a lemon. Place solution in a jar and allow to sit in a shady place for three weeks. Be sure to shake the jar once a day for proper infusion. Place a small amount on a soft toothbrush and massage gums for several minutes. Repeat once each week. It may be possible to prevent gums from receding as long as there is no connection to genetic conditions. Follow regular oral hygiene care. See a dentist every six months. Brush and floss at least twice each day. Brush teeth and gums with gentle strokes in a circular motion. Rinse mouth with water after meals when you cannot brush. Use mouthwash daily to kill harmful bacteria and germs. Consume fresh fruits and vegetables. Maintain healthy diet to boost immune system. Avoid sugary snacks, junk food, processed food, caffeine, and alcohol. Receding gums can happen slowly overtime—there may be no visible signs until the damage is done. Most cases are caused by improper oral care or periodontal disease. It can also be inherited, regardless of oral routine. Gum recession is usually treated by a periodontist with medical procedures, including surgery. You may be able to treat and restore receding gums with natural home remedies. “Receding Gums,” Healthline; http://www.healthline.com/health/dental-oral-health-receding-gums#overview1, last accessed June 12, 2017. “Top 10 Reasons For Receding Gums,” 404 Dental; http://www.404dental.com/top-reasons-for-receding-gums, last accessed June 12, 2017. Sara, “Home Remedies To Grow Back Receding Gums,” Rapid Home Remedies, January 27, 2015; http://www.rapidhomeremedies.com/receding-gums.html, last accessed June 12, 2017. “Receding Gums,” Web MD; http://www.webmd.com/oral-health/guide/receding_gums_causes-treatments#3, last accessed June 12, 2017.